You can't get away from politics, even in a BioShock game. If you've looked at videos of BioShock Infinite and thought, "wow, this really reminds me of the Tea Party," then have no fear, because you're most definitely not alone. 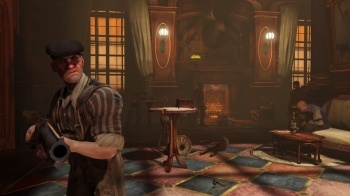 Ken Levine, the game's creative director, says that there are plenty of parallels between real world events and the politics of BioShock Infinite. Besides the similarity to the Tea Party movement, Levine said that the game's Vox Populi faction had a lot in common with the Occupy movements currently taking place all over the world. He noted, however, that Irrational wasn't directly drawing on real world events for inspiration. Instead, he said, it was a case of parallel evolution, where the same ideas and sentiments cropped up within America in an almost cyclical fashion. He also talked about a BioShock game set in the future - and before anyone says it, no, he didn't just say "look at System Shock 2." He said that when a BioShock game was set didn't really matter, as people were pretty much the same whether it's 1912, or some far-flung date in the future where humanity is colonizing Mars.